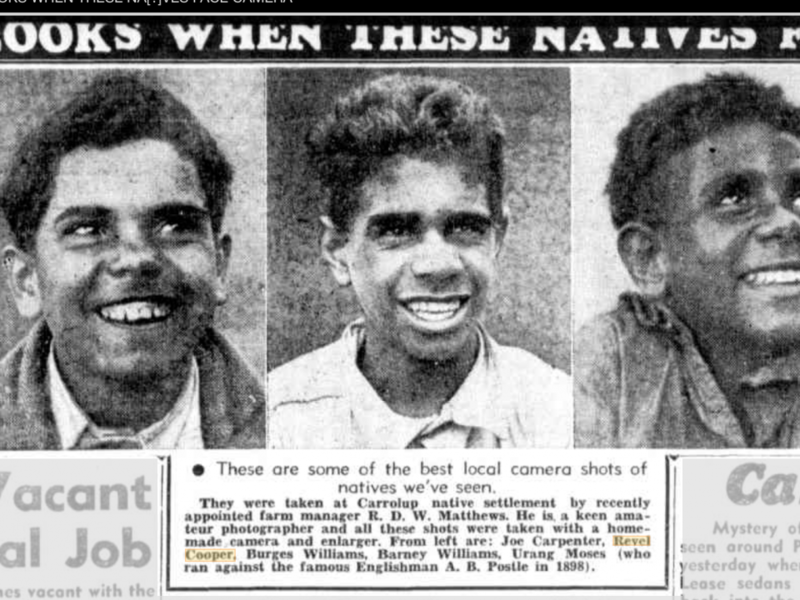 Photographs of three of the Carrolup boys, Sunday Times, 7th July 1945. Retrieved from Trove, National Library of Australia. In my last blog, I wrote how Michael Liu and I found a ‘letter’ written by Carrolup artist Revel Cooper in 1960, which described how the children were ‘running wild’ at Carrolup Native Settlement during the first half of the 1940s. After the coming and going of countless teachers we became a little more civilized. During the stay of a particular lady teacher things started to change for the better. We became more interested in our school work. The new teacher was Mrs Olive Elliot, who arrived with teaching assistant Miss Blond at the end of January 1945. This was the first time that the Education Department has been in charge of teaching at Carrolup. Mrs Elliot was a qualified teacher, unlike the people that the Department of Native Affairs had been using to ‘teach’ the children prior to her arrival. She had many years of experience working in remote and regional schools from the late 1920s. Hygiene was introduced, which we promptly ignored. We dreaded soap an [sic] water. As reported by Revel, the children came to love and respect Mrs Elliot. However, he also noted that Mrs Elliot found the going tough. … this teacher we came to love and respect came to the realization that we were more than she could handle. This point is well-illustrated in the School Journal, which Noel White later wrote in and passed on to his daughter Noelene White. Mrs Elliot found the children to be emotionally reactive and self-centred. She said that they seemed to lack an understanding of each other, and were intensely jealous. Today, we know that these behaviours are signs of trauma. It is no surprise that the children were traumatised, given that they were removed from their parents and had been forced to live in the squalor and brutality of Carrolup Native Settlement. Mrs Elliot eventually decided to leave the school, but not until she had visited Mr Noel White in Narngalu, a small railway siding located about six miles (10 kms) south east of Geraldton. She eventually convinced him to apply for the position of head teacher at Carrolup, but more of that in a later blog. After pursuading [sic] this gentleman to apply for the position of head teacher at Carrolup (much to our sorrow) she left us. Thus for the first time in our life we were going to have a man teacher, and I can assure you we did not like it and we dreaded the arrival of this stranger. Then started the questions. Who was he? What was he like? Was he allowed to cane you? and countless other questions.